To do the same bond as we use is very important. We did many tests at your blades And the performance is very good. The cutting of the blade on concrete road was very good. Cutting life is estimated at 800 meters. Note: Client use our 14" laser saw blade. Segments from you is very good, durable and sharp. Note: Client use our 102mm-300mm diamond segments for core bits for reinforced concrete. First of all I would like to thank you for the sending the samples of the Diamond Saw Cutting Blades. We have tested it and are very much impressed. About your 200mm&250mm tuck point saw blade, we made about 11000 meters and it' s avery good indice! And its good, We need more :) Saw blade 20x 600mm 20x 800mm 3x 1000mm 10x1200mm. 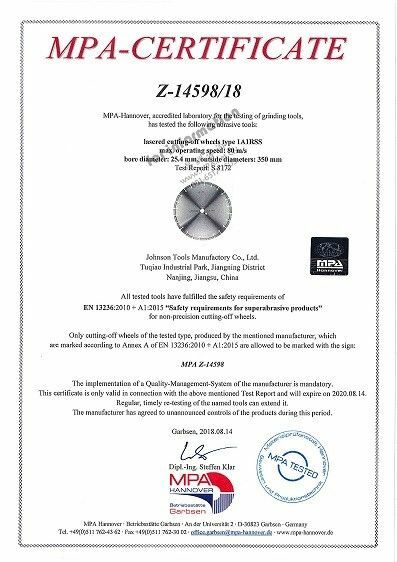 Laser saw blade passed MPA tested! 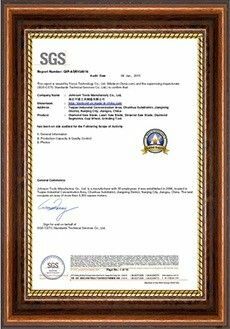 Core drill machine are satisfied by our clients. Diamond grinding discs-Underfloor heating system.